Little is known about exactly how long Guilford has used the “Quaker Man” as its mascot; however, the college’s founding by The Society of Friends no doubt influenced the tradition and the mascot has played a role at school sporting events ever since baseball and football became popular collegiate sports, both nationally and at Guilford, in 1889 and 1892, respectively. "Live" mascot. From The Quaker, 1949. For most of the 20th century, human actors, usually members of the cheerleading squad, have played the role of the “Quaker Man, “ and there are yearbook pictures from the 1940s that show both a “Quaker Man,” as well as a counterpart “Quaker Woman.” Contrary to the Society of Friends’ outward stance against conflict, battle and war, the “Quaker Man” of the mid-century carried a musket and possibly fired it (sans bullet) after Guilford touchdowns. Photos courtesy of Guilford College. Drawing of Quaker couple raking leaves. Photo by me, of a drawing. "buckle Q" on his hat (for Quakers) is constant. * In 1968, John Lambeth decided that a new logo was needed to signify a new era in Guilford’s athletic program. John contacted Duke Hilliard, a Western Guilford High School student, with artistic ability, to design several Quakers. Hilliard came up with different Quakers – a smiling Quaker, a Quaker with mini-glasses and a mean looking Quaker. For years Guilford had used the Quaker Oats passive and benign-looking Quaker as its symbol. 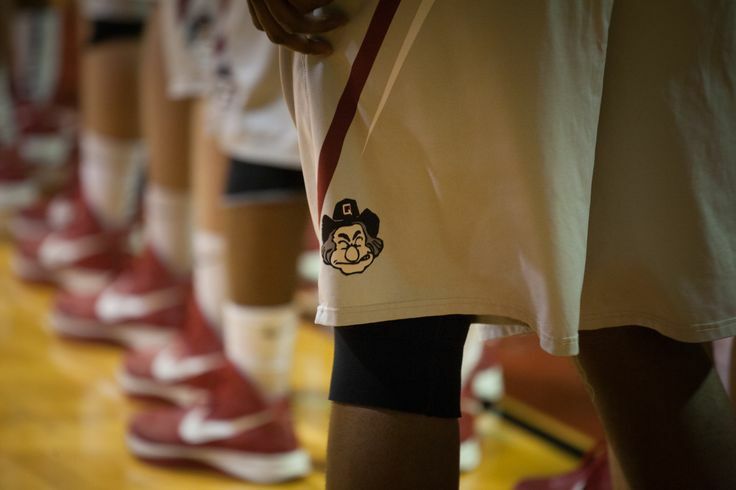 The entire coaching staff immediately selected the “mean” Quaker as their logo, and it quickly became a favorite among the athletes, coaches and many alumni and friends. The new Quaker was the subject of several Guilfordian articles that disapproved of it as a representative or symbol of Guilford College. Herb Appenzeller said that it was merely a caricature, much like the odd- shaped Deacon of Wake Forest, the Wolf of N.C. State, the Blue Devil of Duke and of Ram of Carolina. The new Quaker became a controversial topic within the athletic department when golf clubs, a tennis racquet, a football, a baseball bat and a baseball were added to the logo. Coaches of volleyball, lacrosse and soccer became unhappy because their sports were not represented. As a result the revised Quaker was discarded for the former Quaker logo. The new Quaker weathered the storm for the next few years, but in later years many on campus suggested that Guilford’s new logo, which included the “Black Oak,” replace the Quaker. As a compromise all athletic stationery uses the tree, while only Quaker Club stationery has the Quaker as its logo. (the keyring connection broke long ago). The "G" on Nathan's sweater resembles the "G" on letter sweaters from the mid-20th Century. The main Guilford College founder and leader/elder of the New Garden community, Nathan Hunt. Photo is from the cover of the 75th Anniversary Celebration program magazine cover and courtesy of Guilford College. Since the beginning of the 21st century, a student has volunteered to dress up in an anthropomorphic “Nathan, the Quaker Man” costume, “Nathan” being the name of one of Guilford College’s early founders, Nathan Hunt. 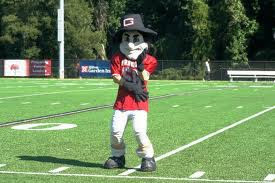 "Nathan" appears at all home football and basketball games, as well as other Guilford home sporting events, to represent the college, drum up enthusiasm, entertain spectators, and cheer on the team. Like all costumed mascots, "Nathan" doesn’t speak, but is often found among the Quaker faithful, striking poses, high-fiving spectators, interacting with children, and generally spreading good will and team pride. His usual halftime center field dance of the "Macarena" is a crowd favorite, as well as his pizza box toss, and of course, when he chucks branded Guilford gear such as T-Shirts into the stands. Nathan doing the Macarena during halftime. Photo: Guilford College. In the video below, "Nathan" does the "Harlem Quake" with a large gathering of students in the Quakeria, a campus hangout for pizza, subs, ping-pong or zoning out on the large saltwater aquarium's tropical fish. "update" Nathan - make him more human, or at least not so...comical. I thought his bulbous, Muppet-like nose, somewhat goofy stance and clothes needed a re-boot. 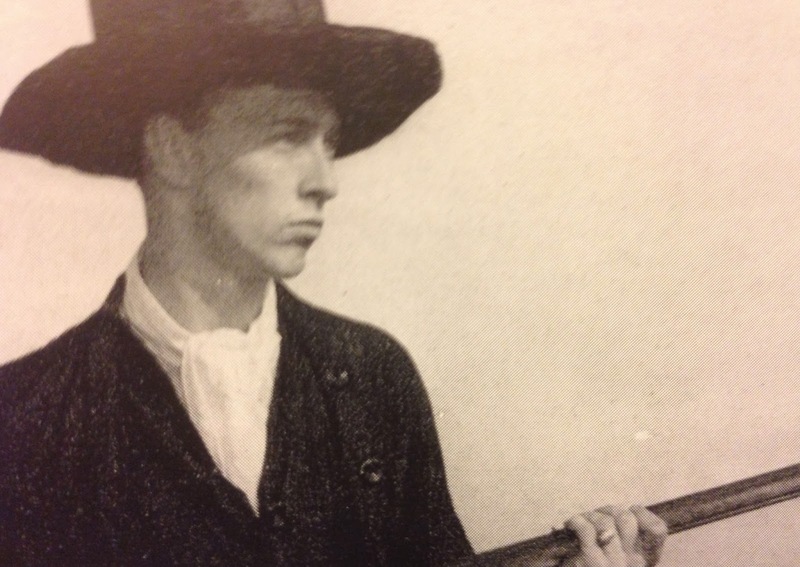 I'd pictured a more life-like drawing of Nathan in the "buckle Q" hat, boots, charcoal or "Quaker gray" long pants, and a light gray sweater with GUILFORD or the "G" emblazoned in dark crimson red on the front, and holding a QUAKERS pennant. His visage would change from "angry" to slightly menacing, with a sly grin instead of a scowl. Apparently, it's a sensitive subject. I was informed by people in the know at the College that tampering with Nathan would be a losing battle. They were right. Its come up several times over the years, with no changes made. Most students, alums, staff, administration, faculty, and all governing boards pretty much like Nathan just the way he is. There is some periodical noise to change his persona, but for the foreseeable future Nathan is here to stay. And I'm cool with that. Besides, just about all living Guilfordians identify with this design...Muppet nose, squatting stance and all. Looks like Nathan made an appearance on football helmets for the final game of 2015!